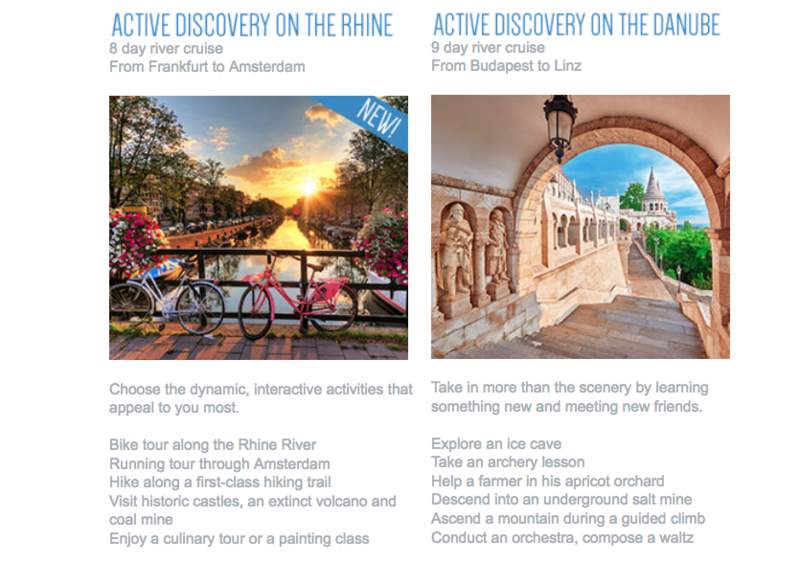 With our Active Discovery Danube and Rhine river cruises, Avalon offers activities for travelers with varying interests and for all energy and fitness levels. From action-packed experiences and interactive discoveries, to traditional sightseeing, you can tailor a vacation to suit your own personal interests and pace. On every itinerary throughout Europe in 2019, an Avalon Adventure Host will be based in a new Adventure Center to help you check out a bike (from onboard your Suite Ship) for a scenic ride through town. Or you can grab Nordic walking sticks and hike to a hillside vineyard or castle – complete with a picnic provided by the culinary team. Whether you are looking for a kayaking excursion on the river or want to participate in a complimentary fitness class on the Sky Deck, Avalon’s new Adventure Host will make it happen. Also, in 2019, the new AvalonGo App will help you independently explore each destination throughout your vacation with a detailed, daily schedule of your itinerary, a list of nearby attractions (with hours of operation, historical facts and more), maps, directions as well as local cafés, restaurants, bars and entertainment options for further exploration. For the traveler who thrives on motion and action, Avalon has created a broad menu of energetic excursions. You might find yourself on a jogging tour through Amsterdam, on a biking tour around Vienna, or even on a paddling trip down the Danube. From a climbing trip up to a medieval castle to hiking in the forest, these included excursions pack real get-up-and-go for those who like to do the same. For those who love to learn, Avalon presents an inspiring selection of interactive excursions created for the different kind of “doer.” These hands-on experiences include a painting class in Amsterdam, tasting locally produced cheese and beer at an ancient abbey, or saying “good morning” to Vienna on an early-riser walk to a quaint café. Local traditions come to life as you shift from observer to participant in a variety of creative outings. It’s the Old World in a whole new way! Avalon Active Discovery is an exciting type of cruise that introduces you to the people and places of Europe in the most active, engaged, and fun ways imaginable. Stay active with a bike tour along the Rhine River, a running tour through Amsterdam, or a hike along a first-class hiking trail. Bike, hike, or canoe along the Danube. Immerse yourself in the history and culture at each port with excursions to historic castles, a culinary tour, a painting class, and even a chance to dress up in real Roman attire at a Roman Clothes Workshop or reenactment of the Roman Games. Tour an extinct volcano and coal mine, and visit sites off the beaten path, such as a chocolate museum...sure to entice your sweet tooth! We offer the chance to explore an ice cave, take an archery lesson, or help a farmer in his apricot orchard. Descend into an underground salt mine…or ascend a mountain during a guided climb.Conduct an orchestra, and compose your own waltz. Every port gives you a world of possibilities as you interact with the locals and choose the dynamic, interactive activities that appeal to you most. What do you want to do on your trip?